The Mazdago (or TCS) was a three-wheeled open "truck" first produced in 1931 that resembled a motorcycle with an open wagon or truck bed. It was steered with handlebars and powered with an air-cooled 1-cylinder engine/transmission combination unit. It was sold by Mitsubishi in Japan. It was considered to be the first autorickshaw. 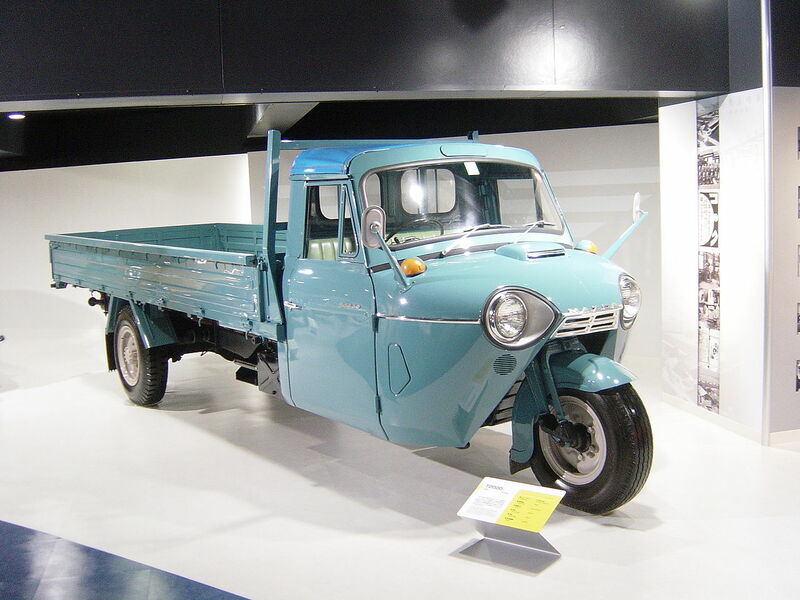 Over the years, it would be produced in different variants and spawned other similar designs such as the Hopestar and Daihatsu Midget. It was also the first vehicle manufactured by Mazda. Note: This photo is from Wikipedia. I do not claim any rights on this photo. All rights and credits belong to the respective owner. This particular die-cast 1/64 scale model produced by Tomytec (of Takara Tomy) is a representation of similar dump truck owned by "Nippon Express" or "Japan Express". The casting, detailing and painting finishing quality is very good, exactly what we could expect from Tomytec at this price point (1,900 Yen = about SGD 24.00 / USD 20.00 / EUR 16.00). Tomytec only made "vintage" vehicle from many years ago, the 1990's, 1980's and all the way backward and on top of that they mainly focus on Japanese spec vehicles only and thus it's pretty normal to see this kind of commercial vehicles with Japanese text on it (in this case it's all Kanji). Oh well, it's a "dump truck" anyway right? Overall, this is a brilliant piece of automotive history item - for the Japanese automobile and truck industry in particular and it's good to have this in our collection though I don't think many young collectors would even like such vehicle but I guess there are some mature adult collectors who would want to have this. For the normal Tomica series (white box and red on the side and big numbers on the box), the local retail price is around USD 4.70 / EUR 3.50 - this is because the big local retailers including some departmental stores import this item so we can get it at such price. For the Tomica Limited Series (the box have this clear plastic cover so you can see the actual car inside and the car have better detailing and use rubber tires), the big local retailer like Toys R Us including those departmental stores did not import them. So they are either only available thru some smaller specific toy/hobby shop or we can order them direct from Japan thru the Japanese online stores. The price will be around USD 16.00 / EUR 12.00 and maybe a little up a bit not far from that amount depending on the models. For this Tomytec Tomica Limited Vintage (TLV) series, with greater detailing and finishing, the price is around USD 20.00 / EUR 15.00 to USD 24.00 / EUR 18.00 depending on models before adding shipment charges because no local shops will really import this particular series as they are truly for certain specific collectors. Hence, we can only get this thru online Japanese hobby shops like HLJ and the rest. So eventually, this particular Tomytec TLV series is never cheap for us either in Asia though I can understand it would cost a little bit more in South America or even in Europe perhaps.